Giving big this year? Keep your presents in storage and help Santa out! It’s no secret that the self-storage business sees a spike in activity in December. We tend to see certain customers who haven’t visited us in months – about eleven, to be exact. Norfolk self-storage comes in handy for homeowners who take pride in lighting up the neighborhood at Christmastime. Garages are nice for holding small boxes of lights, but you will want a secure, climate-controlled unit to hold larger displays and preserve them for holidays to come. Storage units work well for people who decorate like the Griswolds, but even if you stick with a simple artificial tree and few Santa-themed knickknacks you can still get the most out of a self-storage rental in winter. 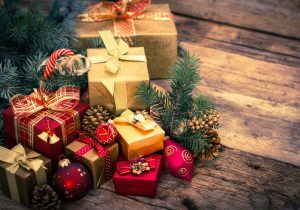 If this is the year loved ones are getting the big gifts – the bicycle, the flatscreen, the giant Barbie townhouse – you need a place to hide everything so curious eyes and hands aren’t checking the closets at home. It’s not unusual to see our customers storing presents with us until it’s time to put them under the tree. We love being part of a nice surprise, and we provide a secure place for your things so you don’t have to worry about damage. That said, you might have questions about what you can and cannot store in terms of holidays items. We do have climate-controlled units that help prevent belongings from getting musty or moldy, but if you have decorations made from trees, like garlands and pine wreaths, you should be careful with them. If they are properly preserved (i.e. the branches dried and the needles sprayed with shellac) they may last in storage until next Christmas. As for storing a used “live” tree for another year…that probably won’t work. For things like inflatables or other displays, keep them in their original packaging for easy identification when you bring them back. If you don’t have the boxes, use airtight plastic bins and label them as Christmas decorations. Use spools to pack light strands so they won’t be tangled or knotted for next year. Also, if you do store Christmas gifts with any facility, be mindful of holiday hours and get everything before the place closes. You don’t want to be locked out of your unit’s entrance and have nothing to give Christmas morning! If you’re new to Tidewater Drive Storage Center, you can still get the first month of rent with us for a dollar. It’s a great price if you need holiday storage in a pinch, and our reasonable rates and quality units can keep your belongings safe through 2018. Contact us today for more information and have a safe and happy holiday.